This tasty, upscale Malbec was originally scheduled to be part of the Toledo Wines and Vines tasting held at Corks. To make sure that it passed the quality standards for the tasting (and because we were thirsty) we popped the cork on this vino a few days before. One sip immediately signals that this wine is a cut above the simple, entry level Malbecs. I'm a Malbec fan, especially liking the accessibility of this grape. Malbec, the signature grape of Argentina, is highly drinkable and there is a whole spectrum of flavors that can be coaxed out by capable winemakers. 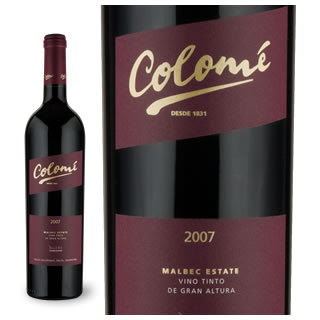 This Malbec is blended with Cabernet Sauvignon and Tannat and aged in French Oak for 18 months. This had floating layers of exotic flavor including incense, fig and raspberry -- quite unique. This wine was named #32 of Wine Spectator's Top 100 in 2009. I paid about $28 for this, but you might be able to pick it up for a few dollars less.